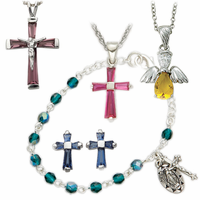 TrueFaithJewelry offers hundreds of Christian Jewelry, St. Christopher Medals, Gold and Silver Crosses, Rosary Beads, Patron Saint Medals, 14K Crosses and Crucifix Necklaces, and much more Religious Jewelry at discounted prices, a secure Yahoo server, quick shipping and professional customer service representatives. Should you have any questions, address them with our customer service at toll-free nr. (800)-516-1392. 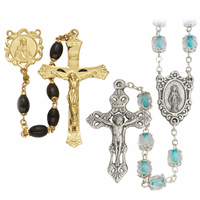 Wide selection of Baptismal Gifts include 14K Gold Filled or Sterling Silver Baby and Kids Jewelry, Frames, Pins, and Crosses. 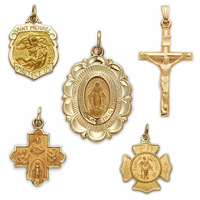 We offer 14K Gold Medals, Crosses, and Crucifixes in many different sizes. Neck chains are optional and can be added to each pendant purchase. 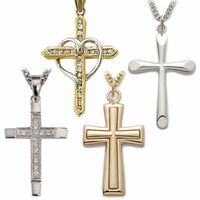 A marvelous selection of crucifix pendants, silver and gold crosses. Styles for men, women and children. 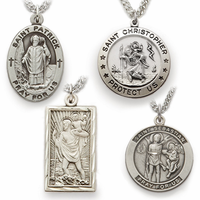 Our Catholic Jewelry collection contains Patron Saint necklaces, Miraculous Medals, Four Way Medals, St. Christopher, and St Michael Medals. 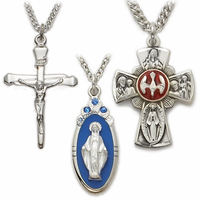 Catholic Jewelry : Click to see all (10) sub-sections. 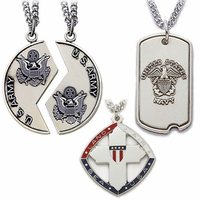 Variety of high quality Sterling Silver Religious Military Medals with choice of St. Michael or Philippians 4:13 prayer on back. 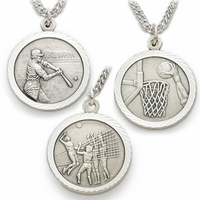 Wide assortment of boys and girls high quality Sterling Silver Sports Medals with choice of St. Christopher or Philippians 4:13 prayer on back. Collection of high quality beautifully designed Sterling Silver Birthstone Crucifix necklaces, necklaces, bracelets and pins with Cubic Zirconia birthstones. Birthstone Jewelry : Click to see all (9) sub-sections.